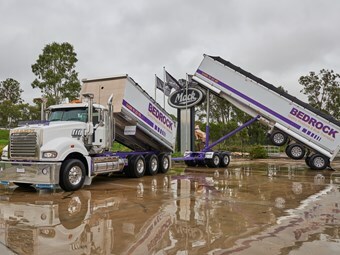 Sydney-based Bedrock Quarry Products & Bulk Transport looked to a big 685hp Mack Super-Liner Tridem for a high productivity, 48-tonne payload, Performance-Based Standards (PBS) combination. Not only is it a high-productivity combination, it looks the part too! The PBS-approved Super-Liner Tridem and 5-axle dog trailer were handed over at VCV Sydney West, with Mack Trucks Global Senior Vice President, Govi Kannan, and Mack Trucks Australia Vice President, Dean Bestwick in attendance. Mack Trucks Sales Manager at VCV Sydney West, Michael Inzitari, says Bedrock Quarry Products were looking at ways of increasing productivity and payload in supplying quarry materials to major civil contractors and concrete plants. "For years and years, sand and gravel was mined out of the Sydney basin for concrete and construction," Mr Inzitari said. "With those quarries now closed, the sand and gravel is pulled from further away − up the central coast and down the south coast, so making the trip in a normal truck and dog just doesn’t make sense when you’re only carrying a 32 to 33 tonne payload." Through the PBS scheme, VCV Sydney West were able to offer Bedrock Quarry Products the potential to achieve higher productivity and the best possible payload through an innovative and optimised design. "We’re constantly looking at ways of increasing our productivity," said Director of Bedrock Quarry Products & Bulk Transport, Mick Colley. "This Super-Liner Tridem that Mack developed can get about a 48 tonne payload - that’s about one and a half of the previous truckloads, and that’s a huge advantage for our business." 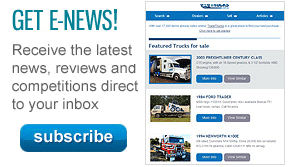 "We have been using Mack trucks for years now, and have an entirely Mack fleet. Quarry work can be rough, and these trucks are built and get the job done day after day. "Now Mack are combining their toughness with the latest in innovation and technology, which means they’re the obvious choice for my business." Mack Trucks Australia Vice President, Dean Bestwick, says Mack Trucks is excited and proud to continue to partner closely with Bedrock Quarry Products & Bulk Transport. 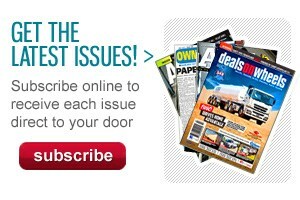 "Bedrock has made the decision, time and time again, to carefully select Mack to build their trucks," Mr Bestwick said. "Their fleet of 13 is comprised entirely of Mack trucks, including three 3-axle dogs, five PBS 4-axle Dogs, two PBS 5-axle dog trailers, one 25 metre B-Double, an 8-wheeler rigid and the newly acquired Super-Liner Tridem. "It’s really satisfying to produce customised trucks that are a perfect fit for the job with unmatched reliability, durability and application excellence; ultimately increasing productivity and profitability for our customers." As other customers also look to increase payload, Dean says the delivery of the PBS Mack Super-Liner Tridem showcases the brand's commitment to application excellence whilst leveraging the latest technology and innovative designs. "Bedrock Quarry Products & Bulk Transport pride themselves on prompt, efficient and reliable transportation of quarry products to each and every customer and Mack stands behind our trucks and our customers in everything they do," Mr Bestwick said. The Mack Super-Liner is fitted with the liftable pusher axle with HLM2 suspension, to allow reduced tyre wear and drag when empty running. The National Heavy Vehicle Regulator (NHVR) approved and PBS compliant combination will allow Bedrock Quarry Products to carry an estimated combined payload of 48 tonne, across an overall vehicle length of just over 24 metres. The Super-Liner features a custom Sloanebuilt Trailers aluminium tipping body and quin-dog trailer, ensuring the lightest tare weight while still achieving maximum strength and durability.